Nutrition for seniors is extremely important, but studies have shown that seniors, especially those who live alone, do not receive optimal nutritional requirements. Such studies have determined that only 17% of older adult populations in the United States consume a quality diet. Delicate Home Health Care provides meal preparation services, ensuring that you or a loved one has access to nutritionally sound food on a daily basis. Our caregivers are experienced in working with all medical conditions including cardiac, diabetic, or low-fat dietary specifications, as well as those under special instructions by their doctors. Our caregivers can prepare meals for the entire day. 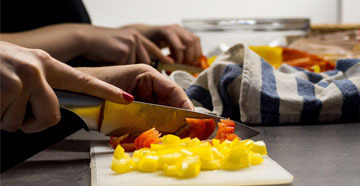 Meal preparation services also include monitoring eating habits and patterns as well as food and liquid intake. Unbalanced diets, lack of appetite and a prevalence of processed foods are common in most senior households. Our caregivers focus on improving the number of well balanced and nutritious, tasty meals for you or a loved one, based on your personal diet. Our meal preparation services don’t stop with the preparation of meals, but include serving, eating assistance, and clean up. Call Delicate Home Health Care today and ask us about our meal preparation services. Nutrition is important for everyone, but especially for our seniors. We want to make sure that you and your loved ones are getting what you need every day. Give us a call at 1-800-216-0372/703-334-0105.